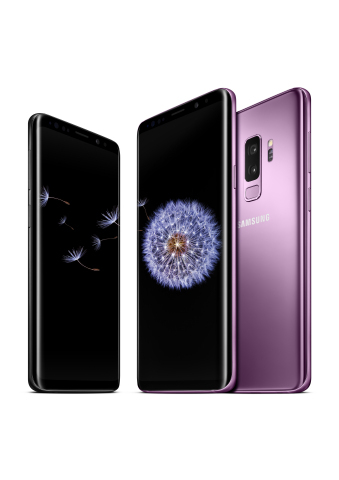 Samsung Electronics America, Inc. announced that the new, award-winning Galaxy S9 and Galaxy S9+, which have been recognized by smartphone reviewers worldwide for their best-in-class display, design and camera, are now available for purchase at U.S. wireless network providers and retail stores. The phones come in three colors: Midnight Black, Coral Blue, and the new Lilac Purple. The Galaxy S9 has a suggested retail price of $719.99, while the Galaxy S9+ is available for $839.99. Both unlocked and carrier versions of the Galaxy S9 and Galaxy S9+ are also available for purchase on Samsung.com. Built for the ways we increasingly communicate and express ourselves with images, videos and emojis, the Galaxy S9 and Galaxy S9+ feature Samsung’s most advanced smartphone camera, and come with a Dual Aperture1 (F1.5 – F2.4) that works just like the human eye to adjust to different lighting conditions. In addition, the Galaxy S9 and S9+ capture up to 12 versions of the same photo to create an optimal image with high contrast, and less noise and grain. In fact, DxOMark awarded the Galaxy S9+ its highest-ever score for a mobile camera. In addition, the Galaxy S9 and S9+’s Super Slow-mo captures footage at 960 frames per second—so a video that lasts for 0.2 seconds can be slowed down to six seconds—making everyday moments, epic. And with automatic Motion Detection, it’s easy to capture even the quickest moments, as Super Slow-mo will start recording the instant there’s movement in the frame. With AR Emoji, users can turn a 2D selfie into a dynamic 3D avatar and choose from preloaded colorful characters or create one that looks just like them. The personalized AR Emojis are also automatically turned into 18 animated GIFs, which can be sent and shared via any app that supports the format. With the Galaxy S9 and S9+ camera, consumers have a new way to engage with the world around them through Samsung’s intelligence platform, Bixby2. Built with deep learning technology, Bixby adds numerous smart functions to the camera, including instant translation of text from one language to another, ability to recognize food and overlay approximate calorie count, and information about nearby landmarks and places. With Bixby, users can even identify products they are looking at, and instantly purchase them from a growing list of retailers. The Galaxy S9 and Galaxy S9+ feature an enhanced entertainment experience with powerful stereo speakers tuned by AKG and the brightest Super AMOLED Infinity Display on a Galaxy device. With premium sound and a stunning screen, it’s easier than ever for users to immerse themselves in their favorite content. Both the Galaxy S9 and Galaxy S9+ support the new SmartThings app. The app provides a single, unified destination for consumers to monitor and control their compatible connected Samsung and non-Samsung devices—so managing a connected lifestyle can be as easy as flipping a switch. With the Galaxy S9 and S9+, essential consumer-favorite features come standard—like IP68 water and dust resistance, expandable memory, fast and wireless charging and a headphone jack3. In addition, the Galaxy S9 and S9+ support the fastest network speeds, including gigabit LTE up to 1.2 Gbps, giving users the best call quality and data speeds available on their network today. With the purchase of a new Galaxy S9 or Galaxy S9+ on Samsung.com, owners are eligible for a free month of Samsung Premium Care—the only support program that comes to you at your home, office or favorite coffee shop. The service also includes damage protection, an extended warranty and quick turnaround service or a replacement device. In addition, Samsung recently announced an expansion of its in-person support for mobile devices with the addition of more than 300 Samsung Care authorized uBreakiFix service locations across the country. By early 2019, Samsung and uBreakiFix plan to add nearly 200 more Samsung Care authorized service locations in the U.S.
For more information about the Galaxy S9 and Galaxy S9+, visit news.samsung.com/us/galaxy-s9/. 1 Dual Aperture on rear camera wide angle lens only. 2 Voice command works with a select, growing number of third-party apps; see Apps with Voice in Bixby for a list of compatible apps. Service ability may vary by country or carrier. Instant access to Bixby not available while in: video and voice recording, call, Ultra Power Saving Mode, Emergency Mode, Kids Mode, DeX, DeX Station and Car Mode. Voice command recognizes English (US), Korean, and Chinese (Mandarin). Not all accents, dialects, and expressions recognized. 3 Water resistant based on test conditions of submersion in up to 1.5 meters of fresh water for up to 30 minutes. Rinse residue/dry after wet. MicroSD card sold separately. Galaxy S9 and Galaxy S9+ come with 64GB of storage. Wireless charger sold separately. 4 Screen measured diagonally as a full rectangle without accounting for the rounded corners. 5 Default resolution is Full HD+ and can be changed to Quad HD+ (WQHD+) in Settings. 6 Galileo and BeiDou coverage may be limited.